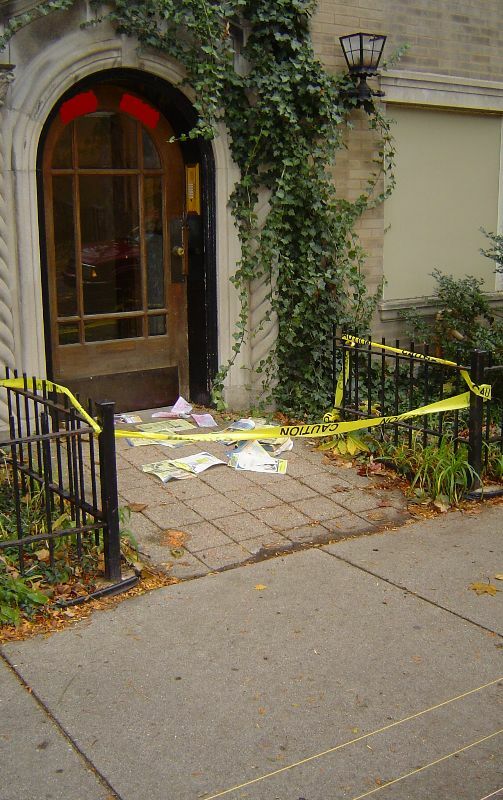 Police are investigating the brutal murder of a Yellow pages telephone advertising book that occurred in the 7300 north block of Chicago. The victim, a thick yellow mass of capitalism, seemed to have been inoffensively sitting outside of a local residence awaiting entrance. Other local Yellow pages were interviewed outside of the condominium complex, but none claimed to have witnessed any wrong-doing. Police chief Malice commented that "it's suspicious that no other Pages, including the menus lying around, witnessed anything. We are looking into the matter with all the necessary resources." The event seemed trivial to some, like Nick Rover who regularly meanders about the block where the murder took place. "I don't understand what's going on," Rover said "This sort of thing happens all the time and no police ever been around here looking. Why now?" Others suspect that the Yellow pages was a member of an elite group of texts performing participant observation research in the area. "So many Yellow pages have been brutalized around here and no-one ever did anything about it before, but this one book gets killed and everybody's on edge? It don't add up," said Brian Bailer, a criminology student who teaches at Harry Truman. Edward Binder, a local antiquarian bookseller, performed the autopsy. "Death was caused by blunt trauma to the front cover and succeeding pages as numbers 1-47 were torn off of the Yellow with a foot or some other flat device. It appears as though the book was tossed into the air repeatedly, then smashed onto the concrete." "We do have the imprint of a canvass high top on the victim's front page to go on," added Malice.